A lot of the custom wallpaper projects we produce seek to enhance and transform an environment. With our mosaic tile wallpaper, the wallpaper itself becomes transformative, moving beyond the confines of traditional wallpaper. Though of course the wallpaper is flat & 2 dimensional, the tile print gives the paper a 3D appearance. Having the authentic look on wallpaper is advantageous for a number or reasons; wallpaper is less expensive than real tile, and it is also easier to install. Additionally, the time in which it takes to install the wallpaper as opposed to tile is much less. Another important factor is that we can print just about any tile finish and texture. That can be simply repeated out for a traditional wallpaper approach. 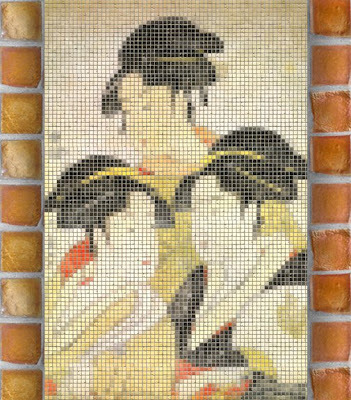 Or, we can convert an image and overlay a tile texture, to create the look of a mosaic tile mural. Such is the look of the Geisha image above. An old Japanese print was scanned, with a tumbled marble tile texture then added in. The resulting mural still is able to communicate that the characters are Geisha, even though they have been simplified compositionally. The tumbled marble look gives an even more vintage appearance to the piece as well. The design process needed to convert images to this look was conceived and executed by Great Wall. The mosaic tile wallpaper can be used in the kitchen or bath, or move beyond the typical places you'd expect to find tile, and have a unique feature wall outfitted with a mosaic mural in your living room or master bedroom. Whether you use the mosaic tile wallpaper as just a border or for a full room, you will be amazed by how convincing and real the wallpaper looks, and how well it will enhance your decor.